Are you figuring out the easy way to sell your house in Torrance? Do you have a house you need to sell in Torrance? If you need to sell quickly, at a guaranteed price, then finding the right real estate investor to work with might be the right decision. Learn about an easy way to sell your house in Torrance by calling me at (424) 242-9304. You might have heard about selling your house to a real estate investor, but aren’t quite sure how it works. You’ve seen the flipping TV shows, but there isn’t much talk about how they bought the house in the first place. What’s funny is that is probably the most important part of flipping. Regardless, this is an easy way to sell your house in Torrance. Basically, when you work with a real estate investor to sell your house, you are working with someone who will buy your house in AS-IS condition – meaning you don’t have to make any repairs or upgrades at all. Meaning, it really is an easy way to sell your house. Why? You aren’t going to be paying any commissions – 6% is normal, which is about $30,000 on a $500,000 house sale, and usually, the real estate investor will pay for all the escrow costs – those tend to be $3,000 to $10,000 depending on city and county transfer taxes, which can be really really high. Your final sales price will be less than that of the MLS list price, so don’t be shocked, especially when you take into consideration all the costs associated with listing a house on the MLS, the difference is usually negligible. And, when you consider that you will close escrow quickly and without any of the typical hassles, you tend to do even better than if you were to list the house – think dealing with real estate agents, open houses, showings day and night, negotiating, repair work, credits to the buyer, contingencies – hoping the buyer’s lender won’t have any problems and hoping for no issues with the appraisal. Here are a few things to know about working with a real estate investor in Torrance. A good real estate investor is making deals happen all of the time. They are like a producer. They know how to calculate repair costs and figure out the best price for your house. Most of the time, they will be the ones buying your house directly. Sometimes, though, they will talk to you about wholesaling your house, where your house will be seen by buyers and investors you probably wouldn’t have been able to reach on your own. They will likely have a network of investors who they will pitch your property to, many of whom will make competitive offers for your house. They do this day in and day out. The experience factor will make selling your Torrance house a quick and simple process. That’s why it’s easy for them and therefore becomes an easy way to sell your house in Torrance. Not all real estate investors are the same. While everyone needs to start somewhere, you should work with someone who has the experience and connections to help you sell it quickly and for a great price. They should listen to your needs and go out of their way to make the process easy for you. Remember, that is their job and you deserve someone whom you can trust, has your best interests in mind and will communicate with you openly every step of the way. Ask questions about the process and speak to past clients. A good real estate investor will be able to provide references and will have excellent reviews online. What Kinds of Houses Will Benefit? 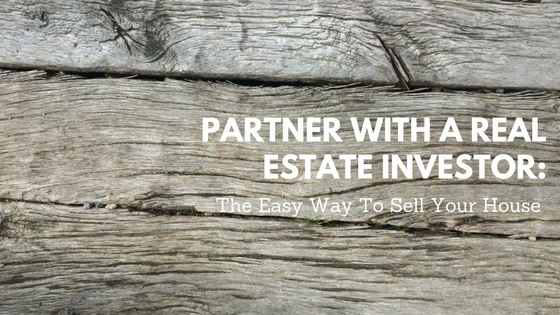 If your house needs work before selling, if you received an inheritance you don’t want to put the time or money into or if you need to sell quickly, selling to a real estate investor is an excellent option. Investors love fixer-uppers and you might find that they look forward to the chance to buy your house and to tackle the project. Personally, I enjoy the renovation part of real estate investing, even with all the issues that come up. This is the area where I think a lot of homeowners get into trouble. They are taken advantage of by contractors or don’t foresee the issues that might arise that aren’t the contractors fault. That’s why the easy way to sell a house is “AS-IS” and not putting yourself through it in the first place. You will save time as well because all of the work is being done for you. It really is an easy way to sell your house. All you have to do is remove the items you want, leave the items you don’t want and wait for escrow to close so you can pick up your check – most of the time, escrow wires the money to your bank account, FYI, it’s so much easier that way. The whole sales process is pretty fast as a good real estate investor will know the market well for home prices and for repairs for your Torrance house. They are buying your house in as-is condition, so you won’t have to throw your money away by making repairs to the house before selling it. There is much less hassle doing it this way. Selling to a real estate investor takes the work out of selling your Torrance property. At The Shenbaum Group, Inc., we provide multiple solutions to homeowners who want to sell their homes in Torrance and nearby areas. Give us a call today to discuss your property and the selling options available to you! We can help you make the best decision possible for your Torrance real estate needs! What Will Buying An Investment Property In Torrance Really Cost you?